Beginning our 43rd season as owners of Whiteland Orchard, we would like to thank all of our customers for their patronage. You are the ones who have made it possible for us to raise our family and remain in business here in Whiteland..
Our Orchard is nestled in rural south central Indiana on a 30-acre family farm which grows apples of many varieties, including Jonathan, Fuji, and Golden Delicious. And while apples and apple cider are our specialty each fall at Whiteland Orchard, our specialty each spring is vegetable and flowering bedding plants and bulk garden seeds. We also grow a variety of fresh vegetables during the summer. Visit “Our Farm Market” in Whiteland, Indiana to shop for apples, apple cider, Johnson County yellow popcorn, bulk garden seeds, pure local honey, Marion-Kay spices from Brownstown, Indiana, and canning supplies. Fresh-pressed in our Farm Market, our naturally sweet and refreshing apple cider is available mid-September through December. But if you can’t wait until autumn, we’re happy to supply frozen cider year-round. Our cider is not pasteurized and no preservatives are added. Available July through December, our fresh apples are the pride of the orchard. There’s more than apples at Whiteland Orchard! June through December, find many other fresh fruit in season satisfy your craving for fresh fruits..
Zucchini, green beans, okra, and other delectable fresh vegetables are planted in the spring and ready to eat by July; tomatoes start ripening late July. Stop in through September to take advantage of this savory, in-season produce. Orders for frozen fruits and vegetables will start in July with deadline Aug. 22. Order produce that will keep you stocked until the next growing season. Order will be delivered on August 30.. Order sheets will be mailed to you on request.There will be only one delivery in 2018. Crisp, juicy apples are hand-dipped in caramel and chopped mixed nuts. Just one of the reasons that fall brings back mouth-watering memories. September to December, visit our Farm Market and sink your teeth into our homemade caramel apples. As the mascot for fall, pumpkins can be used for jack-o-lanterns, centerpieces, and pies. 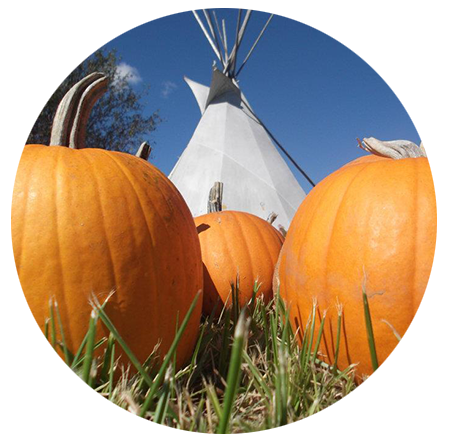 Come with your family during October to select the perfect pumpkins for your home from our pumpkin patch. For 2018 our pumpkin patch is closed. Pie pumpkins are at our store..
That drizzle of honey in your tea, cereal, or on a biscuit gives every day a hint of smooth, sweet flavor. Available all year in our store, locally-produced honey should be a staple on your pantry shelf. Maintaining that fresh fruit flavor year-round, our selection of apple butter, jellies, and preserves add a sweet and tangy note to your breads. Stop in our Farm Market to see which spreads line the shelves this month. Desserts made with persimmons are sweet and delicious; you’ll want persimmons on your holiday menu. Their short shelf life, however, makes frozen pulp the best option. Find this flavorful fruit in our Farm Market. 2018 CROP is For Sale in our store ! Take the garden home with you by selecting the best vegetable and flowering plants for your yard. Watch your lawn come alive with both flower and vegetable plants, available April through June. Be sure to visit our greenhouse in the spring. Planting your own seeds and cultivating personal plants can be relaxing and gratifying for home gardeners; that’s why we offer bulk garden seeds from March through August. Enjoy your produce all winter by preserving your home-grown fruits and vegetables. Canning supplies and Ball Blue canning and freezing book is available all year from our Farm Market. Delight your taste buds with Marion-Kay spices, the perfect addition to many of our fresh and frozen vegetables. Marion-Kay’s 96-year reputation of high quality spices makes us proud to supply their products on our shelves year-round. Since purchasing Whiteland Orchard 43 years ago, Glenn and Becky Haveman have been dedicated to providing fresh apples—as well as many other types of produce and plants—to Johnson County, Indiana residents. The first trees of the orchard were planted in 1933 by Edgar Brown, (the original owner)then Carl and Irene Johnson, making Haveman’s the third family to own and operate the orchard. Glenn and Becky—Buckeye Alumni of Ohio State University—both grew up on farms and studied agronomy and nursing, respectively, in college. They dreamed of one day owning their own farm, and were delighted when the orchard went up for sale in 1975. With the addition of greenhouses in 1987, they created their own farm complete with their five children. The children are grown, and help out when needed. We have 6 grandchildren with a set of twins due early June. The Whiteland Orchard encompasses 30+ acres, 4 greenhouses, and “Our Farm Market”, where they sell their produce which is available during its season while cider and other products are available year-round. “Our Farm Market” is the place to find everything your family needs to make wholesome, delicious meals. Stop in the greenhouses, as well, to see which plants are on display and available for purchase. Based in Whiteland, Indiana, we also proudly serve New Whiteland, Bargersville, Edinburgh, Franklin, Greenwood, Princes Lakes, Trafalgar, Indianapolis, Columbus, and visitors from all around Indiana and the U.S. We’re located a half mile north of Whiteland Road on Graham Road and a half mile south of Tracy Road. You can also find us at the Greenwood Farmers Market. Spring is the time of growth for the new season; so visit the greenhouse to purchase vegetable and flower plants and “Our Farm Market” to purchase garden seeds, onion sets, and seed potatoes. Summer brings a full bounty of freshly-grown products to your table. Apples, other fruits, and vegetables are available starting in July with each having its own time to ripen. That’s also when you can put in your order for frozen fruits and vegetables, to keep you stocked through the winter. Celebrate fall with apple cider, caramel apples, and pumpkins! . Fresh apples, other fruits, and vegetables are available as well, giving you plenty of reasons to come for a visit. Go to our Pumpkin Patch and have the fun of choosing your special pumpkin in the vines where they grow. Enjoy fresh apples are great for eating fresh and baking. Check apple box above for varieties that are still available this winter 2017..
Local honey, apple butter, jellies, preserves, frozen persimmon pulp ,fresh or frozen cider, canning supplies, and Marion-Kay spices are always available at Our Farm Market. Take Whiteland exit off of I -65; go west from I -65 turning north on Graham Rd at roundabout. Go 1/2 mile. Store on right. "We like doing business with people who are totally invested in our community. We find the Havemans to be fair and congenial, people of faith and conscience. Shopping and visiting at the same stop? It’s a good thing."